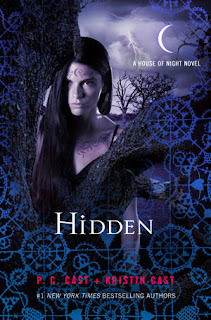 I know I didn't put up any reviews of the House of Night books but I literally read the first six in a week, like two years back and then followed along slowly as the others came out. So the adventure with Zoey is far from over. Its kind of nice to have a long enjoyable series but sometimes it drags just a bit. I think that is why there is the mixing in of other people's POV. Its a nice touch because sometimes always being in the heroine's head can get to be boring and irritating when she's doing some stupid stuff. Anyway, if you read up until this point you know that Auroux was created by that witch Neferet and is her device to try to harm Zoey in anyway possible. But Neferet didn't think that Heath would be making a comeback into the world of the living through another body. Hidden is really full of action and uncovering of secrets. Though I honestly think that the previous books were a bit better, this one wasn't that bad. Kalona was being remorseful, and Auroux found his humanity in some sense. It was surprising that Erebus (Nyx's consort) showed up with hints of jealously. Like really? Kalona is the one thats banished and fallen to earth, the hero in charge of the sons of erebus should of been more, i dunno, honorable? I still like Stark, he might be a bit possessive sometimes but I think he would be the best for Zoey. Even though Zoey can't make up her freaking heart about guys. It was refreshing to read about Aphrodite and Darius again. Their relationship plus Stevie Rae and her man seem the most real. It was nice to meet Shaylin, but damn, I didn't think the twins Shaunee and Erin would end up like that. I give the book a 7/10. I read it because it was the next book in the series and though it added to the series as a whole, and there were some new and interesting plot twists, I think that the series should really come to an end soon. Peace of mind you know.